Medieval armor started with padded garments and Chain mail which were used prior to the development of suits of Armor and then worn in conjunction with the suits of armour. It was designed and developed as protection against any new and even more lethal weapons that were introduced during the violent period. Armour was gradually perfected until the knight eventually became almost a living fortress. Defense was vital on the Battlefields of the Middle Ages and the armour provided essential body protection from the various weapons which were used in battle including the two-handed sword, bow and arrows, crossbow, battle axe, mace, dagger and lance. This type of armor was extremely expensive to produce. It had to be tailor-made to fit the knight exactly. Any incorrect sizing would be extremely dangerous as it could hamper the knights ability to fight. 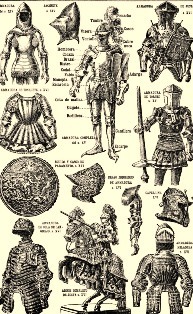 The knights armour was also a status symbol. The better quality of the Medieval Armor, the more important was the Knight. Plate Armour was first introduced during the late 13th century and Full Plate Armour was introduced during the 15th century weighing approximately 50 lbs. Medieval Knight Armor was strong enough to protect the knight, but light enough to allow quick movement on the battlefield. A suit of armour Armor was a complex series of garments, chain mail and iron plate. Medieval Knight Armor provided essential body protection from the various weapons which were used in battle. The Parts of a Suit of Armor were a complex series of garments, chain mail and iron plate which served to provide leg armor, feet armor, arms, head armor, neck armor and body armor. The parts of a covering the legs and the feet were called the Sabatons which foot armor and consisted of riveted iron plates on the boots. Greaves protected the calf and ankles. Poleyns protected the knee cap and Cuisses protected the thigh. The parts of armour covering the arms and hands were the Besagues which were small round 'shields' laced to the mail at the shoulder to defend the armpit, the Rerebrace for the defence of the upper arm, the Vambrace for the defence of the lower arm and gloves called Gauntlets which had ringed metal plates over the fingers. The parts of armour covering the body were the breast plate which covered the chest, the backplate which protected the back and the Faulds which were rings of armour which were attached to the breast plate and protected the hips, abdomen and lower back. The armour covering the head and neck included a Visor which was a detachable piece of armor which protected the face and eyes. In the 13th Century the helmet was called the Bascinet which had a skirt of mail, called an aventail, which protected the neck. Even the horses of the Medieval times were kitted out with armor. The Medieval Warhorse war horse had a dense rounded body with a broad back, strong loins, powerful hind-quarters, and long legs with dense bones. Medieval horse armor consisted of rigid pieces of plate armor made of both of leather and steel. Medieval Horse armor was called 'barding'. A Medieval Warhorse would have horse armor on the head, neck, body and chest. The rear of the horse would be covered with a padded cloth. Stirrups were added later. Medieval horse armor also protected the head and was often highly decorated. Spiked horns were added to the mask armor of the horse resembling the look of a legendary unicorn. An ornamental cloth covered the Medieval horse armor which was called a trapper. The Medieval Times website provides interesting facts, history and information about knights of old which scatter the Medieval History books including the subject of Medieval Armor. The Medieval Times Sitemap provides full details of all of the information and facts about the fascinating subject of the lives of the people who lived during the historical period of the Middle Ages. The content of this article on Medieval life and times provides free educational details, facts and information for reference and research for schools, colleges and homework for history courses and history coursework.